An election poster in Cameroon. Any hopes that oppression of the opposition in Cameroon would be eased after the swearing-in of President Paul Biya on Tuesday were dashed with the arrest of opposition leader Maurice Kamto. The arrest was announced by Kamto's lawyer Agbor Nkongho and seemed to belie the conciliatory note struck by Biya in a speech given after the swearing-in ceremony to a seventh term of office. Biya recognized "the frustrations and aspirations" of the English-speaking North-West and South-West regions, where a deadly conflict has been raging since last year. He promised "a good number of answers" and an acceleration of the "ongoing decentralization project." 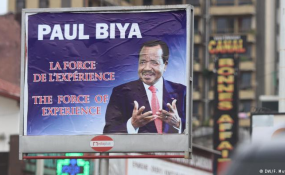 Is Biya about to change his policies of repression and look for solutions for conflict? "No, this is not a hopeful sign," Cameroonian analyst Tanda Theophilus from the International Crisis Group (ICG) research organization told DW. The president has acknowledged the plight of the people before; but by labelling them separatists 'terrorists' he also makes it clear that he is not willing "to dialogue with them," Theophilus said. Hundreds have died in the conflict between separatists and government troops. Resentment is growing. "[The president] should ask his military to stop. He is the one that declared war against us. We expect from him is to stop the fighting and killing of our brothers and sisters," 32-year old Shoe Mende Cletus Fonyuy told DW. Fonyuy fled the English speaking north western town of Kumbo after his wife and brother were killed last month. Analysts fear the situation in the country is bound to escalate, not only in the Anglophone regions. Yondo Black, a lawyer and veteran Cameroonian activist for democracy believes that if nothing happens soon, a civil war "will be unavoidable." And that also explains why there are soldiers out in force all over the country, "as if we were in a war", although the president won the election. It shows a great unease among the ruling class, the analyst said. "We have to avoid reaching the extremes. The extreme is an insurrection. Once started, you have no way of knowing how it will end," warns lawyer Yondo Black. But people are fed up, he added, pointing to the elevated costs of the swearing-in ceremony and the money going into the preparation of the Africa Cup of nations Cameroon will be hosting in 2019 as just two examples of mismanagement. This is happening in a country where people don't have "enough money to eat or go to a doctor". "Even the Romans, who invented the policies of 'bread and circuses', put bread first," Black said. Young people are especially hard hit by the dire economic situation. 24-year old Christopher Bime who obtained a certificate in building construction, makes a living selling fruits on the streets of Yaounde. He needs a job to stop entertaining thoughts of going to Europe. "Biya has been there for 36-years and young people are suffering too much," Bime said. Black concurs and admits that his view of the future of the country "is very bleak." It is a view that seems to be shared by Cameroonians from all walks of life. "I don't expect anything from Biya. 36 years in power is too much," cart pusher Fridoline Amba told DW. Analyst Theophilus puts some hopes on the opposition and its capacity to grow in strength and unity during the next seven years. But talking to DW before the news of opposition leader Maurice Kamto's arrest was announced, the Cameroonian researcher said that for now he did not see any positive prospects: "The regime is used to using violence and legal threats." Theophilus said Kamto is careful to always stress that he is for a peaceful approach, which indicates his fear of being pursued. A fear the latest developments seem to justify. In the past couple of days, the streets of several cities were filled with opposition supporters protesting the outcome of the elections. Scores of members of the leading opposition party Movement for the Renaissance of Cameroon (MRC) have been arrested and indicted. Lawyer Yondo Black puts part of the blame for the situation in Cameroon squarely on the shoulders of the international community, which he calls out for hypocrisy. "The fact alone that Biya has been president for 36 years should be reason enough for them to say something." But to get no reaction even when Cameroonians are dying "is unacceptable." The lawyer feels that there is enough evidence of crimes against humanity in Cameroon for making a judicial case against those responsible.